I have always been fascinated by the construction of clothes, even as a child. I want to know how things go together. As I grew up and began making and buying my own clothes, I became more and more interested in how clothes stay together. 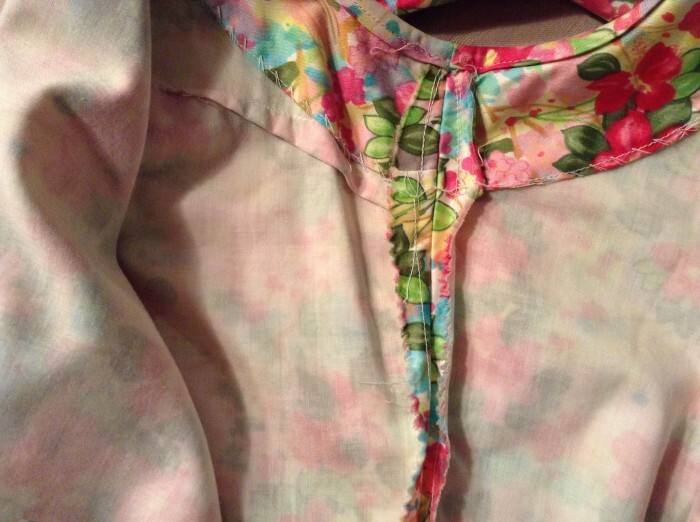 We have so much machinery and technology available to us, and affordable to the home sewist these days, that it’s easier than ever to whip up a garment in a couple hours at home. 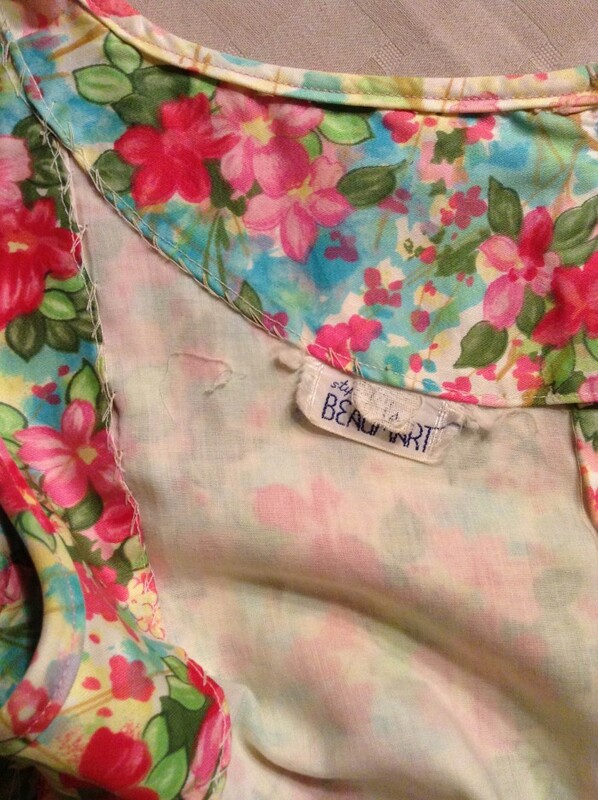 I’m always surprised when I turn a vintage garment inside out to see the finishes inside. Their complexity to achieve finishes for which we have specific machinery nowadays, yet handmade look they have (even ready to wear) astounds me! I have had a crazy polyester print sitting in my stash for quite a while, and honestly I never thought I would use it. Recently, though, Ella has become interested in Vintage EVERYTHING. We went to Cleveland last weekend to see Neko Case at the Beachland Ballroom and while having Mother’s Day Brunch (gluten free biscuits with vegan mushroom gravy and a page-long cocktail list? YES PLEASE! ), we discovered a vintage shop called “This Way Out” in the basement (there was no way out, by the way) where she tried on every dress. Because my girl is big for her age, and because she somehow still has a toddler-like belly, she can wear Adult size S clothes, though the shoulders are always too large – naturally. John and I encouraged her to get a couple dresses anyway, and she has been wearing them constantly. I asked her when we got home from our weekend away if she’d like a new dress from vintage fabric. “That’s still Vintage, right?” she asked. Once I reassured her that she could still refer to her new, handmade frock a Vintage Dress, she was game! I was delighted to get the chance to make her something bike-rideable from the polyester I picked up once upon a time at a Small Craft event. Ella and I studied the insides of the dresses we picked up in Cleveland, and chose the details I would emulate in my design. 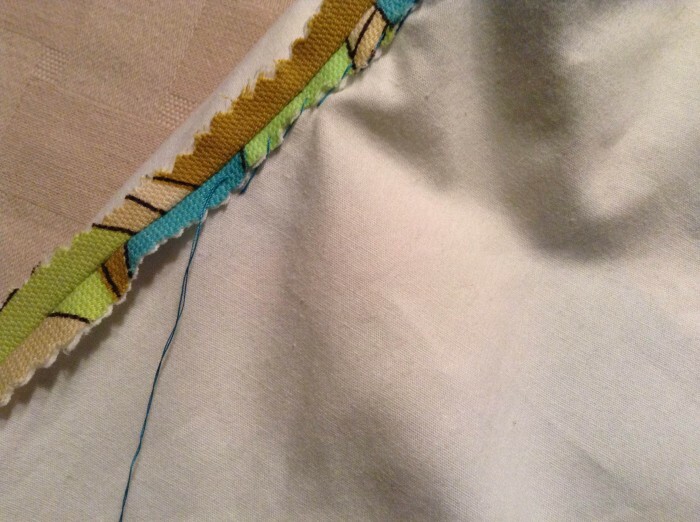 One of the construction techniques which surprised me was the use of both facings and lining, while the facings are stitched to the lining. 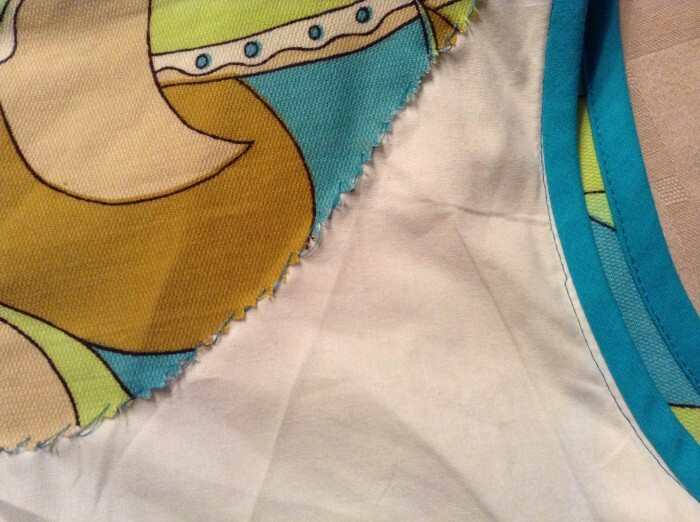 Ella’s arms are much smaller, therefore she has smaller arm openings, and I assumed these were placed on the original dress in case the arm opening gapped so the original fabric would be visible rather than the lining fabric. 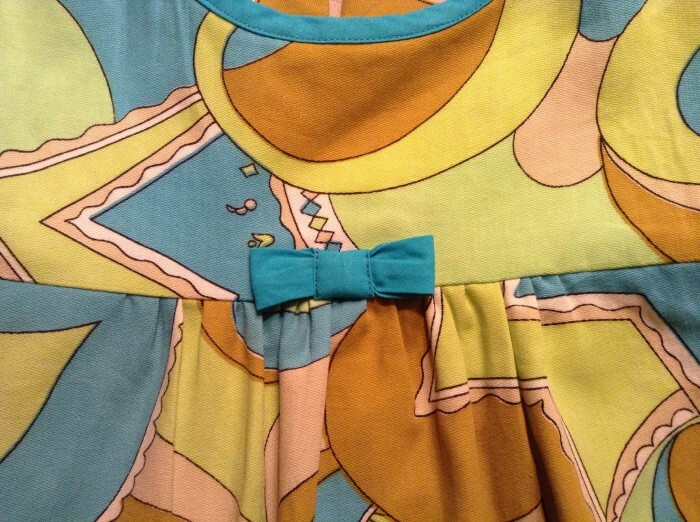 The lining fabric used on the vintage dress is very thin. I assumed also that the facings were used to increase the durability of high-wear areas. My lining is strong, so I omitted the armhole facings. There’s a sweet bow detail on each side. Bows are tied, then stitched down. While it’s a different shape, I stitched down Ella’s squared-off bow as well. As you can see, she really loves it! Best of all, it’s bike-riding compatible! I always prefer to use natural fibers in my sewing, especially for kids, but re-use is important to me as well, so this project was just the perfect combination of cheeseball polyester print, organic cotton muslin (lining), and the timing of this Vintage May series hosted by Kristen and Jessica! That print is totally vintage-awesome! I love how the dress turned out-so adorable. thanks for doing vintage may with us! It turned out beautiful! What fun fabric. And I’m happy to see the insides with the facing. 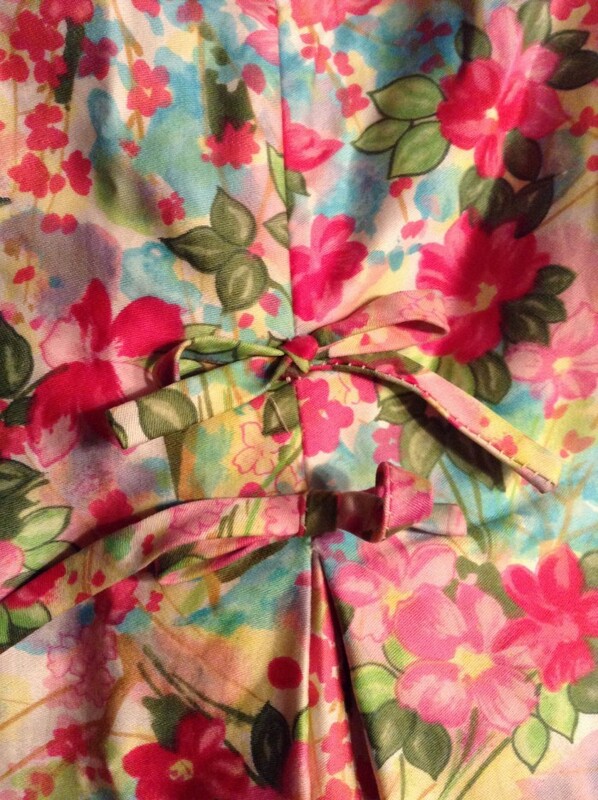 I recently made a vintage dress and sewed on a facing. It won’t lie flat and was considering sewing it doe. But I’m not very good at hand sewing. What stitch did you use? Oh thanks April! I used to think I wasn’t”good” at hand stitching, either, but you know what? It’s inside so no one will see it, and: practice. I promise, you’ll feel confident once you do. I just whipstitched the pinked edge. aw what a great story and adorable dress! 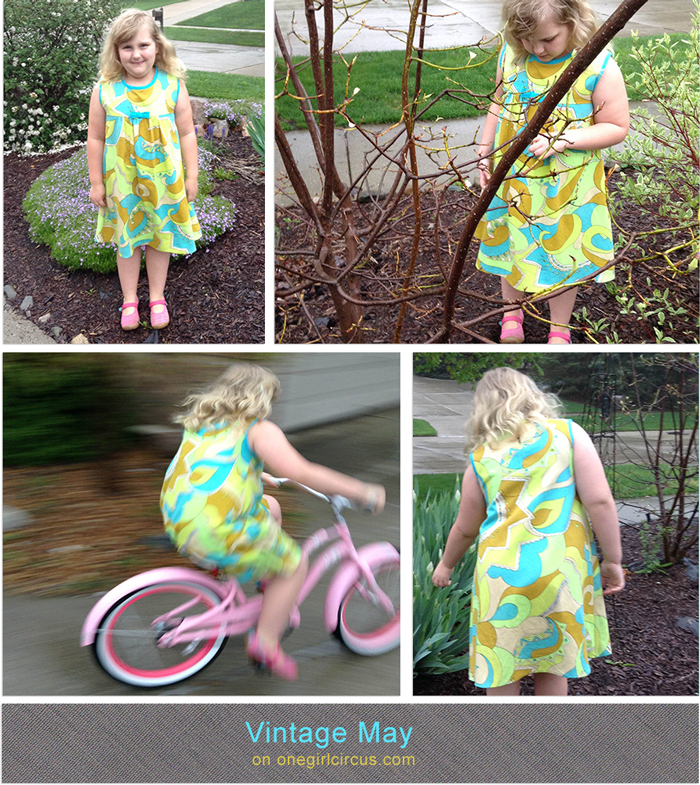 we had no idea how perfect our timing was with Ella’s current vintage obsession! 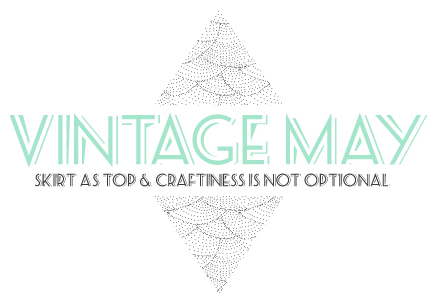 thanks for joining us for Vintage May and have fun at quilt market! I can see how much she loves her dress by her sweet smile. It really is a groovy print. Thank you for showing the vintage seam finishes–I am definitely going to start studying them myself. Previous Post: Classic Typography. Classic Snark. Next Post: Maker Mail #1 !